Pena Blanca Lake was known as the belle of the ball, number one on sportsmen’s dance card, when it was completed and opened to visitors in March 1958. However, as one of the smallest desert watering holes on the Mexican border, the 45-surface-acre lake has been loved too much, and it has been in need of a touch up. Despite the aging process and the lake’s assorted wrinkles, sometimes older does turn out to be better, and this popular attraction  senior citizen of southeastern Arizona’s lakes  is on the rebound. It is again being referred to as THE place to be for hikers, wildlife lovers and anglers. "If you’re looking for bigger bass in this part of the state, this is the place to find them," says Don Mitchell, Regional Fisheries Specialist with the Arizona Game and Fish Department. "Lunker-size largemouth bass, in the five-pound-and-up category, are well represented in these waters," he says. Mitchell should know. He conducted last year’s G&F surveys, which showed a healthy population of lunkers as well as hatchery-stocked rainbow trout and resident channel catfish and bluegill, red ear and green sunfish at Pena Blanca Lake. 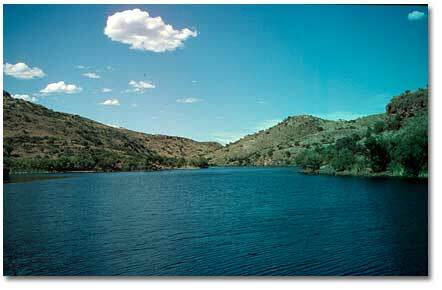 At the moment, the fish, birds and wildlife  not resorts or restaurants  are the main draws at the lake. Many of the former amenities are boarded up, at least for the time being. For over 40 years, concessionaires offered motel accommodations at the Resort Lodge and home-cooked meals at the restaurant. Picture windows allowed diners a lakeside view with their meal. RV’s had a place to park. Fishing licenses and bait could be purchased. Boat rentals were so popular they were often available on a reservation-only basis. Today the White Rock Camping and Thumb Rock Picnic Area are equipped covered picnic tables, grills, rest rooms, a boat launch ramp and a floating fishing dock. Otherwise, it’s just you and nature. "The Forest Service is currently discussing the possibility of establishing a new facility here," says Area Wildlife Manager Ken Stirn of the Game and Fish Department, "and perhaps a small store to sell bait and offer boat rentals." In the meantime, it’s quiet. Visitors appreciate the solitude offered by the facility that began in 1957 as a simple earth-filled dam about a tortilla toss away from the Mexican border at Nogales. Built by the Arizona Game and Fish Department in a narrow canyon protected by the adjacent Pajarito Mountains, the scenic setting is a watery magnet that continues to lure tourists from nearby desert sands to its grassland vegetation. Travelers to lakeside have two options. 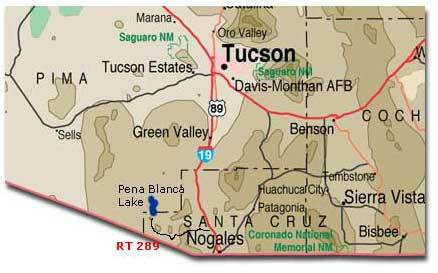 To reach Pena Blanca the easy way, take Interstate 19 south of Tucson for 60 miles (or five miles north of Nogales on I-19) to the Ruby Road Exit. Head west on County Road 289, a rolling two-lane blacktop for about 10 miles to the parking lot. Those with a greater sense of adventure, no concerns over time or speed, and heavy-duty shocks can reach the lake via the unpaved portion of Ruby Road. This is a graded-gravel experience reached by taking the Arivaca exit on I-10 and traveling through working cattle ranches, cottonwood trees and abandoned buildings in ghost towns such as Ruby and Camp McKee until the Pena Blanca Lake signs appear. When a setting summer sun hits the twin peaks to the south, the result is a hue that resembles white gold. The 4000-foot high area, located at an environmental transition zone where desert cactus and oak and mesquite thickets both grow, has attracted Indians, Spaniards, cattle ranchers and silver and gold prospectors. The mark of the miners turned out to be the most serious scar. In 1993, the Arizona Department of Environmental Quality announced that water quality tests had shown a high level of mercury in the lake, nearly three times higher than safety standards set by the federal Environmental Protection Agency. "When storms flooded canyons in the adjacent mountains, contaminated soil from mine tailings of the early 1900’s were continually washed into the lake," says Will Hayes, G&F Fisheries Program Manager. The Arizona DEQ issued a public advisory against eating the warm-water game fish (like bass and catfish), the first such notification ever issued in Arizona in response to potential mercury health risks. 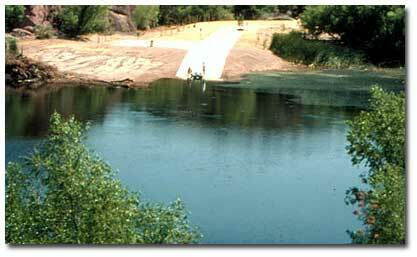 The old mine tailing ponds were dug up in late 1999, and more than one thousand tons of contaminated soil hauled away to prevent additional toxic pollution. All traces of mercury are expected to disappear within this decade and normal conditions will return. While definitely an environmental setback, the heavy metal concern is expected to ultimately help the angling public. "Before the mercury advisory, 13-inch bass would go home with anglers," says G&F Fisheries Specialist Don Mitchell. "When that announcement was made, many visitors stopped coming. For those who continued to visit, Pena Blanca turned into a catch-and-release facility where fish can be caught, released, grow some more and be caught again." Veteran fishermen will tell first time anglers that Pena Blanca is a "sleeper," an unfished waterway with all kinds of structure from cliff ledges to shoreline bulrushes. "There’s a ton of standing timber in the lake," says Hayes, "and the grass and reeds add an entirely different dimension. This place is just heaven." There’s a lot broken at this lake that will take some time to fix, but optimism abounds. "That’s the hand that was dealt," says Hayes, "and that’s the hand we’ve got to play. We just have to incorporate these environmental curve balls into our long-range plans to manage and protect our desert water recreation sites with even more tenacity." For additional information, call 1-520-281-2296. There are resorts, hotels and motels in Tubac, Tucson and Nogaleswith something for every taste and price range. For more information and a complete list. Click on city for Rates, availability and reservations online.